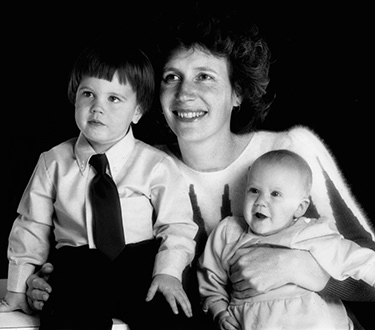 Janet Pietsch, ’83, holds her two children, Casey and Lauren Karbowski, in this 1985 photo, taken nine months before she died of pancreatic cancer. Photo courtesy of Mike Karbowski. Janet Pietsch, ’83, had every reason to live. Her second child, Lauren, was four months old and her son, Casey, was a little over two. Her husband, Mike, a perpetual student who already had a Ph.D. and an M.D., had finally finished his UW residency and was starting his career as an anesthesiologist. The family was moving into their first home and her photography—she had an M.F.A. from the art school—was on display at local galleries and art museums. Which is why, when she got the terrible news in October 1985 that she had pancreatic cancer, she fought with every particle in her being to beat the screamingly unfair prognosis. Traditional cancer treatments, macrobiotic diets, meditation, she tried them all. Yet, Janet—like 99 percent of the other pancreatic cancer patients in the U.S.—was dead less than a year after learning she had the disease. I know, because Janet was my friend. My wife and Janet went through their first pregnancies together, forging a diamond-hard bond that is, I think, unique to first-time mothers. When her second child decided to arrive ahead of schedule, we found Janet, Mike and Casey on our doorstep at 4 a.m. Could we watch Casey while they went to the hospital? Of course we said yes. A few weeks after Janet’s diagnosis, my wife and I found out that we were expecting our second child. When we told Janet, she congratulated us and said she was going to be there for his birth. But she didn’t make it. Janet died 14 days before he was born. I hate everything about pancreatic cancer, but what I hate the most is its lack of hope. It is a death sentence with no prospect of a pardon. So far, of the 35 patients in the program, none has contracted the disease. But these families aren’t living normal lives. If doctors find precancerous cells in the pancreas, patients face a life-or-death choice. Continue to live with the threat that those cells may turn into the disease (doctors can’t be 100 percent sure that they will), or have surgeons remove the pancreas, becoming an insulin-dependent diabetic for life. Our story on one patient follows Sheri Mayer through her painful decision after losing her mother and brother to pancreatic cancer. Sheri feels she made the right choice and has new hope for the future. That’s a great gift from this great institution—a gift of hope. It is something I wish we could have given Janet.